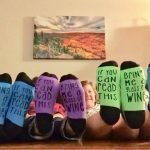 Fall Food & Wine Lovers Weekend! The Fall Food & Wine Lovers Weekend is almost here! November 2nd & 3rd will include special events focusing on food and wine – and of course, it is all set against the backdrop of Lake Superior! Bluefin Bay has been hosting Food & Wine Lovers Events for more than 20 years and we’re delighted to partner with Mpls-St. Paul Magazine as our media partner for this long-standing event. 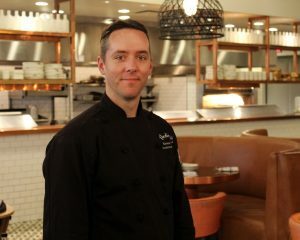 We’re excited to welcome our guest chef for this year’s Friday & Saturday night dinners: Executive Chef Keven Kvalsten from the FireLake Grill House & Cocktail Bar in Minneapolis. Read his full bio here. 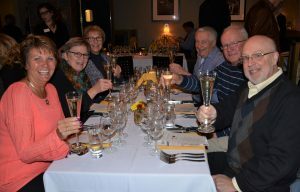 Each course will be paired with wine by our friends at Johnson Brothers Wine Company making the evenings a real treat for those who love great food and wine. Join us! We still have a few reservations left for both Friday and Saturday evenings. 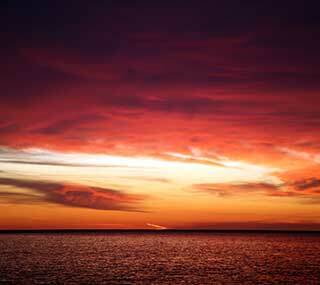 Call the Bluefin Grille at 218-663-6200 to make a reservation. Get Ready For The Gales! Witnessing the gales on Lake Superior is one of the iconic experiences on Minnesota’s North Shore. Late October, November, and December are the best times to see the biggest wave show as the cold, dry air from the north meet the moist, warm air from the Gulf. Wind speeds often reach 50 mph with gusts that have been known to exceed 70 mph. 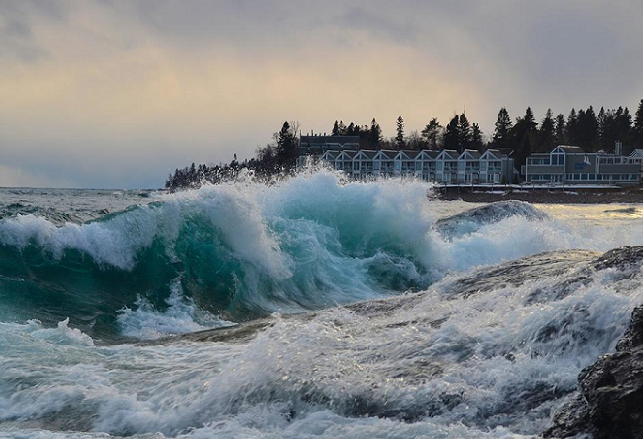 You’ll be mesmerized as the huge waves repeatedly crash into the shore. SPECIAL OFFER! When nature puts on a show, you want a front row seat and there is no better place to watch the gales roll in than from the Bluefin Bay Family of Resorts. 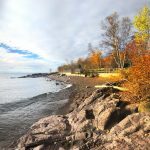 When you stay three nights at any of our resorts (Bluefin Bay, Surfside or Temperance Landing) on the Gales Special, one of those nights of Lake Superior splendor is our treat! Stay three nights and receive one of the midweek nights FREE! This great offer starts October 21 and runs through December 24, 2018. Relaxing in your accommodations and watching the waves roll in is a favorite activity this time of year, but there are lots of other adventures and events that you may want to take advantage of. During your stay, sign-up for a complimentary resort activity like a variety of guided hikes, yoga, winery shuttles, Saturday Kids Club, plus resort amenities like indoor and an outdoor (heated!) pool, nightly bonfires with s’mores, board games and movie rentals. Once the snow flies we also offer complimentary rentals of snowshoes, cross-country skis, ice trekkers for hiking, ice skates, and hockey equipment. 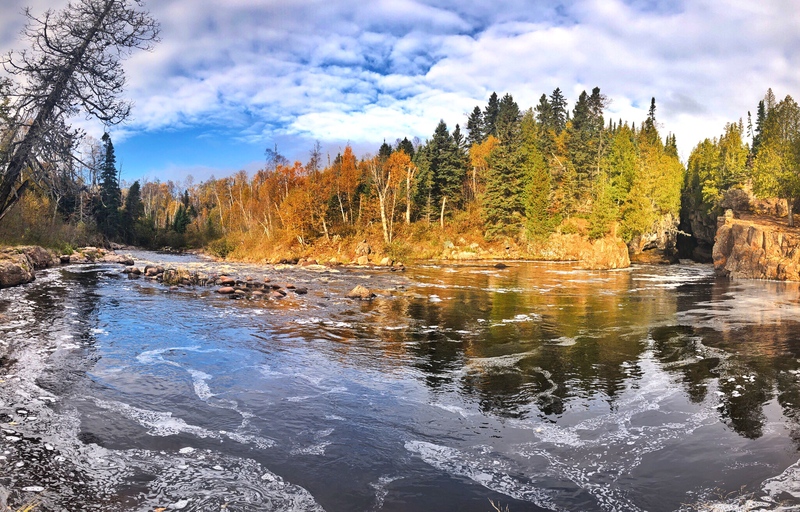 Fall Colors AND Rushing Rivers! Peak to Past Peak in most areas! Another fall color season is coming to an end. We’ve hit the halfway point in the month and most areas on the North Shore are at peak or are now past peak. 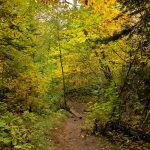 Many of the hiking trails are lined with brightly colored leaves that produce that ‘autumnal crunch’ we all love. 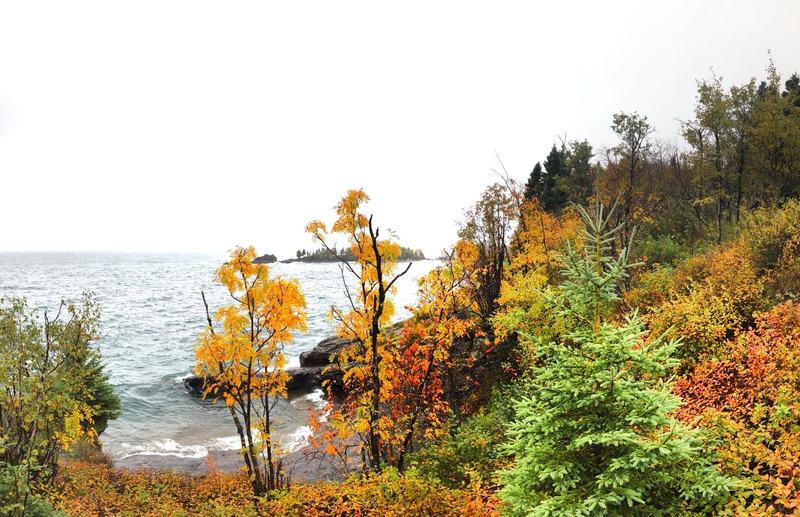 As is typical along Lake Superior, we are still experiencing nice color and leaves on a majority of trees. From the parking area on Highway 61, you can also head north and travel inland along the Temperance River. Another bridge just a quarter mile along showcases the deep river gorge and the wild river that has really been flowing after the recent rains. We almost thought it was waterfall season! 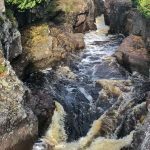 Be sure to follow the trail farther north to check out a few other wild curves in the river that offer a pretty good show as the water swirls and rushes along. 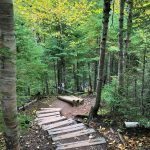 We offer many complimentary guided hikes and bike & hike trips to this popular not-to-miss destination. 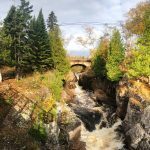 The colors are quickly going past peak but the bonus this year is that river and waterfall viewing should be added to your fall adventure itinerary! 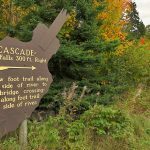 1+ miles inland: 75% – Peak Color! 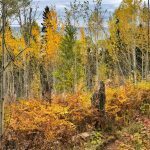 50-65% Fall Colors along Lake Superior. We didn’t let a little rain stop us from heading down the coast along Highway 61 to Sugarloaf Cove today to check out the fall colors. The mist in the air actually made the golden colors more vibrant and the lake was putting on a great show as the waves crashed in. 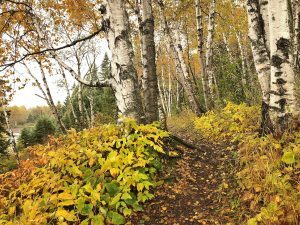 The birch and aspen along the shores of Lake Superior are changing to their beautiful yellow and orange colors with pops of red sumac. The dark green evergreens provided a stunning contrast. 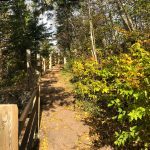 We trekked along the easy one-mile interpretive trail that took us through forests, along the shores of Lake Superior, over a beach filled with smooth round rocks, and to the remnants left from the boom of the logging era. Grab a map or check it out online for information on the 17 marked interpretive areas you’ll come across on the trail. If you haven’t been to Sugarloaf Cove yet we recommend a stop here or you can join one of our complimentary guided resort hikes to this wonderful place. 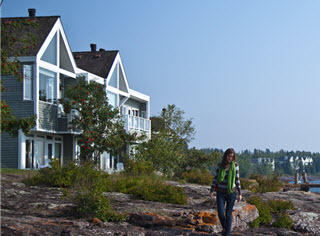 Sugarloaf is The North Shore Stewardship Association and was founded in 1993 to protect and restore Sugarloaf Cove and the entire North Shore. 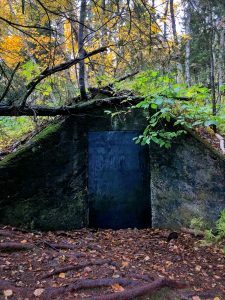 It provides educational programs to become better stewards of our lands and you’ll love their interpretive nature center with exhibits on the unique history and ecosystem of Sugarloaf. 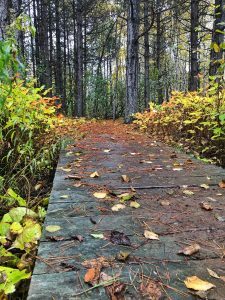 Visit their Calendar of Events to discover their weekly programs like bird banding, North Shore Geology, and Fall Migration. They will also be having an open house on October 20th from 10am-2pm complete with speakers and family activities. 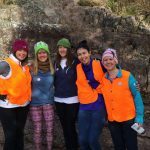 Our Annual Girls Gone North Weekend (now in its 11th year!) is coming up November 9-11. It’s time to start making plans for a girls trip with the other special women in your life. Take advantage of this much needed time to reconnect, laugh, have an adventure, relax, escape your normal routine for a couple days, unplug and unwind. You deserve it! Gather for happy hour. 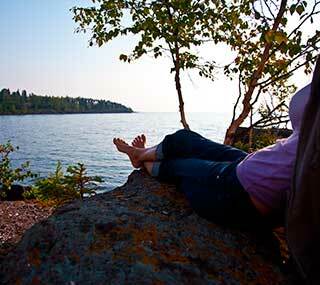 Join a “girls only” guided hike. Spend a relaxing day at the Waves of Superior Spa. Watch the waves. Soak in the hot tub. Ditch your diet. Forget your phone in the room. Try yoga. Learn something new. Go shopping. Drink wine. Laugh! On Saturday evening we hold a signature event with a different theme or activity each year. This year we invite you to gather at our Waves of Superior event space located at Surfside resort from 5-7pm for a fun and relaxed evening led by a skincare expert! You’ll get personalized recommendations on how to develop, nurture and maintain beautiful skin. 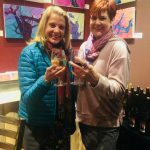 Of course, we’ll also have a wine tasting happening at the same time so you can mingle with your friends, sample some amazing products, ask your beauty questions, and join in on a skincare analysis session. This girls weekend wouldn’t be complete without a great lodging offer! Receive two nights at 15% off OR stay three nights and receive one of those nights FREE! See the offer details and book here now. Enter to Win a FREE Girls Gone North Weekend!! The contest runs through October 11th…enter soon! Good luck! Winners will be contacted in mid-October via direct message on Facebook, Twitter or Instagram. 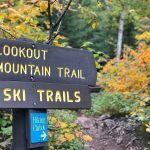 Fall Color Report: Happy October From Lookout Mountain! 1+ miles inland: 50-75% Fall Colors. 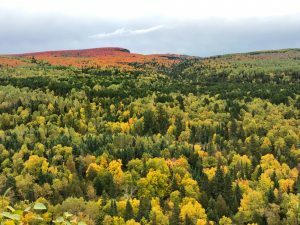 30-40% Fall Colors along Lake Superior. October is here! 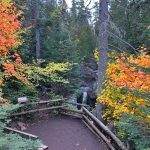 We decided to celebrate with a morning hike to Lookout Mountain in Cascade River State Park to check out the fall colors. After a couple of cold nights this past week most of the area is now in prime fall color viewing. 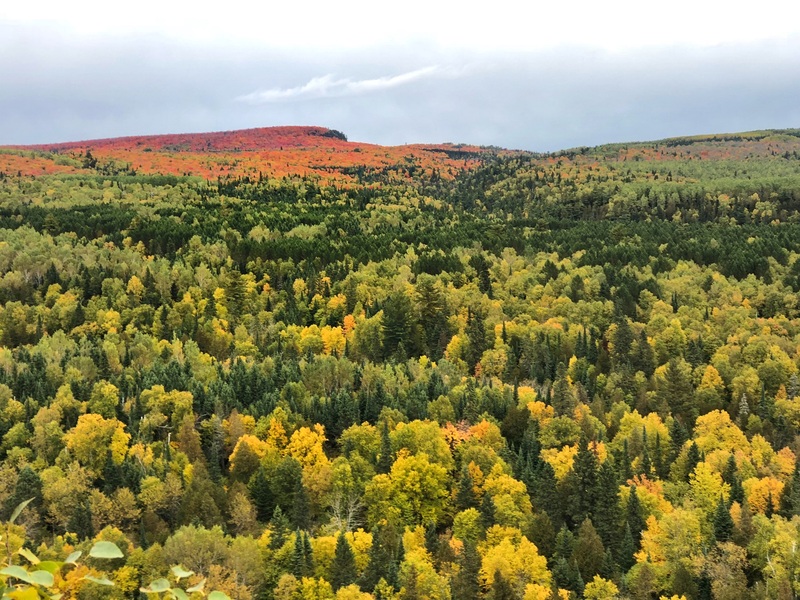 We are still only at 30-40% fall colors closer to Lake Superior but the farther inland maples and aspen are showing their best bright orange, red and golden colors! 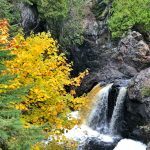 For today’s hike, we started off on the same route that our complimentary guided Cascade River Hiking Trip goes on – winding along the beautiful Cascade River with stops at a series of stair-stepping waterfalls which give this river its name. If you are looking for a little longer hike with the addition of some breathtaking overlooks we suggest trying the trail to Lookout Mountain. 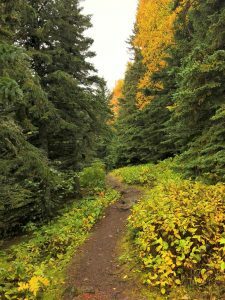 This out-and-back 3.5-mile trek along the Superior Hiking Trail through cedar, birch, aspen, and maple forests ends at an overlook with breathtaking views of the Sawtooth Mountain Range in full color. 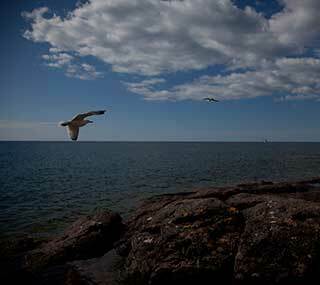 Plus, you’ll get great views of Lake Superior and the shoreline that leads up toward Grand Marais. This overlook is the perfect spot to stop for a snack and some Instagram-worthy photos!